Everybody wants a lifestyle business – getting to do what you want to do and where, on your timeline and with who you choose, all while getting paid. It’s a step out of the constraints of the cubicle and corporate structure, a shift toward freedom and the holy grail of “making it.” And yet – if you have been blessed with the ability to create this lifestyle for yourself, then you know that for the people who have made it, the big secret is that there is another step. Once we take care of the fundamental need for food, clothing and shelter; secure meaningful employment and sip a few piña coladas on the beach of success, something inside us starts to feel unsatisfied. We want more. And not just more stuff, but more meaning. You might look around and wonder: Now what? However or whatever you call it, all of these models have one thing in common: we won’t feel completely satisfied until we reach that final stage. Developing a lifestyle business is a vital step along the path that takes us one-up from merely surviving, but creating this lifestyle is about more than just breaking free from the cog-in-the-wheel mentality. It’s about taking 100-percent responsibility for your life. When you give up blaming and complaining, you are also taking up the cause of your own personal betterment, and so you are right to ask the question, now what? It was the famous philosopher and educator William James who summed up the answer in one of my all-time favorite quotes: “The great use of life is to spend it for something that will outlast it.” This, in a nutshell, is the final step when creating a lifestyle business. It allows you to take your personal success and turn it into something bigger, something meaningful that will outlast not just your physical stuff but your physical self as well. 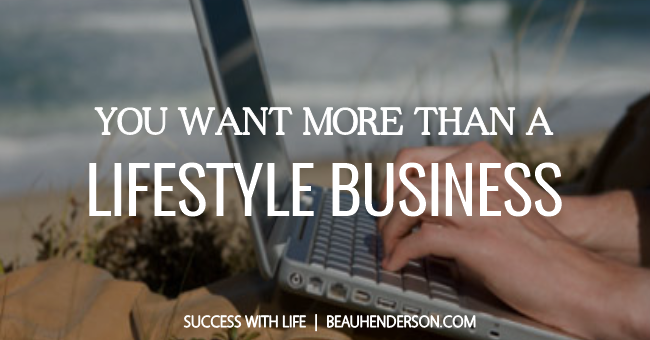 I think of this final stage as turning your lifestyle business into a legacy business. It’s the process of taking your gifts and talents, your experience and wisdom, and using all of it in the service of others. Your legacy business is your gift to the world. It’s what you have to give away to make life better, but it also has a way of making you better. Legacy by definition isn’t just the financial wealth we leave behind; it’s anything that can have a positive influence on others. We are all the product of such legacy when you think about it, whether from the grandmother who taught you respect or the teacher who first believed in you. We all have moments that shape us, habits or sayings that stay with us and make up your way of being in the world. This inheritance is what make us better people, and so the best way I know to honor that legacy is to add a piece or two of your own. For me personally, I’ve identified financial literacy as the area of my legacy business. I have made it my goal to reach 1 million children through books and live presentations that I have started delivering personally to local schools. No matter how big my business grows or how many awards we receive, it’s giving financial literacy to children that excites me the most because this is what can last through generations. Imagine how much better the world would be if everybody was living to their full potential, working on their legacy business instead of just existing as another cog in the great wheel. Once you take care of your own personal success, ask yourself, how can you take what you know and pass it on? Helping others completes the loop to improve both yourself and the world. It’s your turn now. We would love to hear about YOUR lifestyle and legacy business.